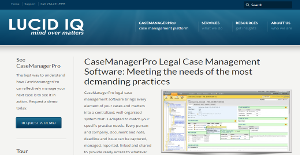 CaseManagerPro is a powerful cloud-based legal case management solution developed by Lucid IQ. This software gathers all components and information pertaining your cases and matters and stores the a centralized system, making it easy for you to organize and build your cases and match them according to particular practice requirements. Users enjoy a plethora of features and capabilities such as massive data capture options, quick and simple association of information, and sharing them to other parties and colleagues for effective collaboration, brainstorming, and case building. CaseManagerPro promises law firms with improved productivity and significant reduction of costs while remaining compliant to industry standards. CaseManager Pro gives law firms of any size a throng of benefits that stem from using their legal case management software. Loaded with useful features and capabilities, CaseManager Pro offers case management tools, collaboration tools, administration tools, calendar and scheduling tools, contact management tools, billing and accounting tools, and more to help them deliver topnotch service to their clients and keep on growing as a business. With CaseManager Pro’s matter management features, law firms will find it easy to maintain a high level of organization of their files, information, etc. This also results in enhanced productivity and client services. With better organization, law firms are also able to improve their responsiveness. Collaboration becomes easy and productive with CaseManagerPro. With effective communication tools, lawyers, experts, and external counsels can share documents, information, and ideas among others to create stronger cases. These collaborative tools also contribute to improving data accuracy as the quality of data is thoroughly checked and verified. Calendar features of CaseManagerPro ensure that all important meetings and events are tracked and schedules are followed to the tee. Creating tasks and setting deadlines is a walk in the park. The integration with Outlook also simplifies group and subject calendar control on top of accessing and viewing relevant communications. CaseManagerPro also offers a global search capability, enabling users to perform simple keyword search, Boolean search, wildcard search and advanced filtering to help them find the information they need. If you are interested in CaseManagerPro it may also be beneficial to investigate other subcategories of Best Law Practice Management Software gathered in our database of B2B software reviews. It's crucial to keep in mind that virtually no app in the Law Practice Management Software category is going to be an ideal solution able to fulfill all the goals of different business types, sizes and industries. It may be a good idea to read a few CaseManagerPro reviews first as specific services might excel exclusively in a very small set of applications or be prepared with a very specific industry in mind. Others may work with an intention of being simple and intuitive and as a result lack complicated functionalities needed by more experienced users. You can also come across solutions that cater to a large group of users and provide a complex feature toolbox, however this usually comes at a more expensive cost of such a software. Make sure you're aware of your requirements so that you buy a software that has specifically the features you search for. How Much Does CaseManagerPro Cost? CaseManagerPro’s SMB and enterprise pricing information is available only upon request. Contact the company for more details, and ask for your quote. We realize that when you make a decision to buy Law Practice Management Software it’s important not only to see how experts evaluate it in their reviews, but also to find out if the real people and companies that buy it are actually satisfied with the product. That’s why we’ve created our behavior-based Customer Satisfaction Algorithm™ that gathers customer reviews, comments and CaseManagerPro reviews across a wide range of social media sites. The data is then presented in an easy to digest form showing how many people had positive and negative experience with CaseManagerPro. With that information at hand you should be equipped to make an informed buying decision that you won’t regret. What are CaseManagerPro pricing details? What integrations are available for CaseManagerPro? CaseManagerPro fully integrates unique data and practice requirements throughout the system, even in the most complex scenarios, so they can be used to gain efficiency and accuracy, help teams communicate more effectively and provide better reporting and analysis.